Sebastien Ogier secured the World Rally Championship for a third year running in September. 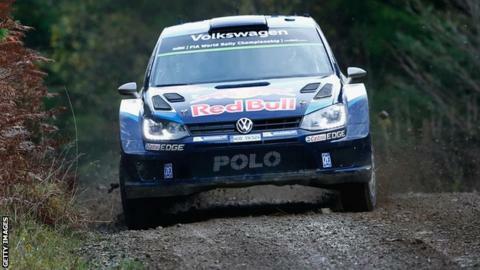 World Rally champion Sebastien Ogier leads after six stages of the season-ending Wales Rally GB. The Frenchman, who in September won his third world title in a row, is 13.5 seconds in front of Northern Irish driver Kris Meeke. Wales' Elfyn Evans ended the day in eighth, having slipped back from fifth. Dolgellau-born Evans is hoping for a top-three finish, but had a puncture at Hafren on stage four and initially dropped back to ninth. Evans, alongside co-driver Daniel Barritt, improved on the final stage of the day at Myherin to move up one place.